Editors Keys' Vocal Booth Pro bundle is an all-in-one voice recording solution aimed at both the broadcast and music-making markets. You get a microphone and shock mount, a pop-shield (for removing annoying pops from the beginning of plosive 'p' and 'b' sounds), a mic stand and the Vocal Booth Pro itself, a 'soundproof' shield designed to stop your voice reflecting around the room and thus colouring the sound. The centrepiece is, of course, the microphone. 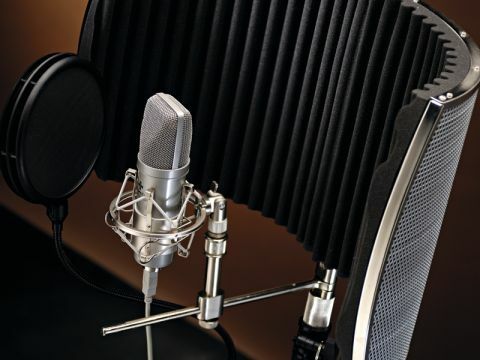 The Editors Keys SL150 is a large-diaphragm condenser mic, the same type the pros use to record vocals and instruments such as acoustic guitars. It's actually a USB mic, meaning it acts as an audio interface and pops right up in System Preferences as an extra input source. The mic lacks an XLR output (so you can't use it with sound gear such as mixers and so on – it has to go into a computer), and while this is standard for microphones in this price bracket, it does make the mic's 'Studio Series' label a bit of a misnomer. Still, it does a perfectly acceptable job of recording both talking and singing. Again, performance is on a par with similarly-priced XLR condensers, and it certainly cuts the mustard for pro broadcast work. Unlike most mics, however, the SL150 lights up when plugged in – a neat feature, although it's a bit unnerving to put your lips so near to electrical equipment illuminated in a shade best described as 'high-voltage blue'. The rest of the hardware isn't quite as neat. The mic stand feels cheap, and the large slugs of metal used to mount the Vocal Booth are difficult to assemble and poorly manufactured. The Vocal Booth Pro itself is a clamshell design, with the mic-facing side covered in sound-absorbing, high-density foam. Rigged up, the mic does a fine job. Reduced reflections from the room means a less diluted sound, making vocals tighter, more concise and easier to mix. Overall, it's a respectable if slightly flawed offering, which provides very decent results on a home budget.